Welcome to the first Guilds of Ravnica Preview Week. Today, I'm going to start telling you about the design of Guilds of Ravnica. I'm also going to introduce you to the Vision Design team and show off a cool new preview. I hope that sounds like fun! Let's get to it. As always before I jump into the story, I like to start by introducing you to the Vision Design team behind it. I should note that this team did the vision design work for both Guilds of Ravnica and Ravnica Allegiance (more on why below). 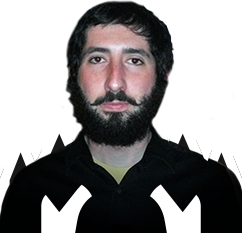 Jules first landed on our radar as one of the people that was helping out on the Great Design Search 2. Part of the competition was working with members of the community who were designing cards requested by various candidates. 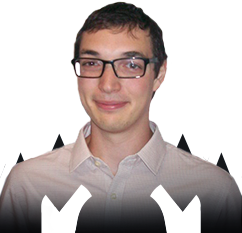 Jules then got involved in Goblin Artisans, a website dedicated to Magic card design. Years later, he was one of the names for a summer internship, and I gave a good word for him because I had read several of his Goblin Artisan articles and was impressed by how he thought about the game and card design. That internship would turn into a full-time job. Jules was my "strong second" on the Vision Design team, meaning he was in charge of keeping up the card file. This was Jules's first time in that role, and he did an amazing job. I first learned about Jackie on the Pro Tour. She had originally joined R&D as a developer (the role former pros usually joined as—nowadays it would be on the Play Design team), but after talking with her, I was interested in having her do some design work for me. 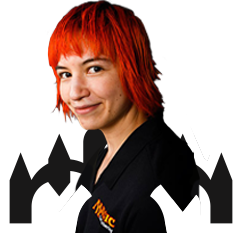 Jackie thought about Magic design in a very different way, and I like having team members who approach problems from unique vantage points. Jackie always asked questions that made me think about things I hadn't questioned before, making her the most mentally stimulating member of the team. Ari was the creative team representative. Previous Ravnica blocks had been a little light on story, but as this year was the third act in what we internally had called the "Bolas Arc," I knew we were going to need an expert. Because the story adds an extra layer to how we approached the guilds (more on this in a moment), I appreciated that Ari was always around reminding us about how this version of the guilds was a little different. He made sure we took that into account as we were building each guild's mechanical identity. The set design lead for Dominaria, Dave Humpherys, had also been on the Vision Design team for that set, and everyone liked how that worked out, so we decided to start having the set design lead on the Vision team. Erik Lauer, the set design lead for Guilds of Ravnica, had a schedule that was too full to do this, but Sam, who was leading set design for Ravnica Allegiance, was luckily able to join us. Sam has a good grasp on what makes mechanics and themes viable for Constructed and, thus, did a good job of always making sure we were thinking ahead with the mechanics we were designing. Part way through, Sam got pulled off on another project, and Bryan stepped in to fill what we would now call the play designer role. 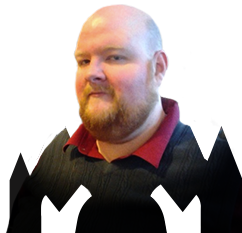 This person helps balance the cards and is always keeping an eye out for the tournament viability of whatever we do. Bryan came in part way but caught up quickly and was a valuable addition to the team. And finally, there's me. You guys know me. The challenge of this design was that we were doing Guilds of Ravnica and Ravnica Allegiance in one combined six-month vision design period. That meant we had a lot on our plate and, as you will see, there were many balls to keep in the air. Before I can even get to discussing Guild of Ravnica's vision design, I have to take a step back to talk about how it and Ravnica Allegiance even came about in the first place. The Creative team had been mapping out the Bolas Arc. We knew that we wanted to end with a big dramatic event, one that had a lot riding on it. We also knew that the location of the final event mattered as we wanted there to be some jeopardy; we wanted the players to care that it was happening there. It became apparent pretty quickly that there was one obvious choice—Ravnica. It had all the components the story needed and it was the most popular plane with the players, meaning that it being in jeopardy would matter. There was just one problem. We didn't think the players were going to be happy if we returned to Ravnica and it wasn't about the guilds. That mechanical guild identity has already been tied so strongly to the plane. So, we proposed that what we do is first return to Ravnica and give the players what they expect: two sets of guild play (it had to be two sets as ten guilds can't fit into one set). We could use the Return to Ravnica/Gatecrash model of five each with its own standalone Draft set (this wasn't what got us to move to the draft-alone large set world we're in, but it definitely had some influence). Then, once we'd given the players their fill of guild-infused Ravnica, we could do our big event expansion set on Ravnica, but not specifically about Ravnica. This was a pretty radical idea, (having a set where the importance of an event supersedes the importance of the world) so it took a while to get everyone on board with the plan, but we eventually did. Now that we get to the point of the story where we start Guilds of Ravnica's vision design, let me set the scene for what was going on at the time. 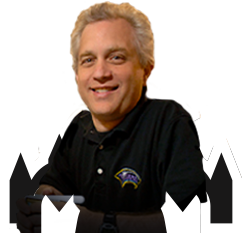 Dominaria was the first Vision Design team I ran (and also the first ever Vision Design team) and when I ran it, we assumed that it was going to be a two-set block with a large and small set. The "three and one" model (our current three large set and a core set structure) hadn't happened yet. Guilds of Ravnica and Ravnica Allegiance were being treated as a single block with the exception that they were both large sets and drafted separately. That meant I only had one Vision Design team to do both. (At the time, vision design took six months, as there were just two blocks a year to work on. With the "three and one" model, there are now three vision designs a year, each four months long.) Luckily, the structure and theme of Ravnica were already understood, which made the task feel doable. Once we knew that the year was two normal guild sets followed by an event set, the Creative team was able to start working on the fine details of the story. The first two sets would take place mostly while the events of Ixalan and Dominaria were going on, which meant the Gatewatch would be busy elsewhere. These two sets were going to be about Nicol Bolas trying to slowly influence the world of Ravnica and warp it to his needs. We would focus on the guilds as they internally fought between the forces pulling them toward or away from Bolas's influence. For years, we'd talked about how we wanted to find a place to do film noir, a set that would occur mostly in darkness with shadows and moodiness. The guilds already had a political intrigue component, so adding in Bolas allowed us to give the two sets a cold war feel that would present Ravnica in, pun intended, a different light. All the guild squabbling, internal and external, would be put to use telling the larger story. The Creative team then split the guilds in half. Five would fall under Bolas's influence, and five would not. (Although, I should point out that each guild has elements pulling in both directions.) The five guilds that fell to Bolas would each have a planeswalker, beholden to Bolas, who would lead the guild. The creative team spent a great deal of time picking which five would fall to Bolas. Their choices were swayed a lot by the story that they wanted to tell. There would be five guilds in Guilds of Ravnica and five in Ravnica Allegiance. Each color had to show up in exactly two guilds in each set. Because five guilds were falling to Bolas and we wanted the two sets leading up to the event set to feel as if things are getting worse on Ravnica, we wanted the first set to have two Bolas-leaning guilds and the second set to have three. That way the progression felt as if Bolas is gaining in power. For story reasons, a couple of guilds had to be in the first set and a couple in the second. We wanted to have a mix of fast, medium, and slow guilds in both sets. We didn't want to break the set down by ally or enemy colors as we can do that anywhere. Ravnica lets us break up the two-color combinations in ways no other set could, so we wanted to take advantage of that. Ideally, we wanted guild mixes different than what we'd done before. In the end, we found that we could meet the first six constraints with one and only one combination of guilds. For Guilds of Ravnica, it was the exact same breakdown as original Ravnica (Boros, Dimir, Golgari, and Selesnya) plus Izzet. That meant that sadly we couldn't meet the seventh constraint (unless you consider "plus Izzet" to be functionally different). One of the ideas I pitched early on (I think as far back as Guilds exploratory design) was the idea of shaking up the structure of how we made guild sets. Having one keyword mechanic per guild was a great way early on to help convey the guild structure, but now that we had two iterations under our belt, perhaps we could rethink how a guild set is designed. (Five named keywords per set, for example, was above our current average.) I, and a number of the other designers, had some cool ideas on how to change things up. The third set, however, was already pushing in pretty innovative space, and the whole reason we did Guilds of Ravnica and Ravnica Allegiance in the first place was to deliver the guilds as people knew them before getting to the event set. The decision was reached to not reinvent the wheel this time around (I was given permission to "have at it" for the fourth visit, though) and spend our energy on execution rather than restructuring. What all this meant was that we were going to design this set similarly to past Ravnica sets. This meant focusing on a guild's mechanical feel and finding a keyword that reinforced it. For the past two Ravnica blocks, we had a rule that every guild keyword had to be new. This time, we decided to relax that rule. If we found something that worked well but already existed, we were free to use that. Before we can get to the individual mechanics, let me first talk about a meta issue of choosing mechanics for a Ravnica set. Because Ravnica sets focus on two-color pairs, Draft will primarily be about drafting two- and three-color decks. The two-color pairs will be the five two-color pairs of the guilds in the set. The three-color combos will be the pairing of any two guilds (which interestingly gets us all ten three-color combinations). Two-color combinations will have access to three guild keywords. 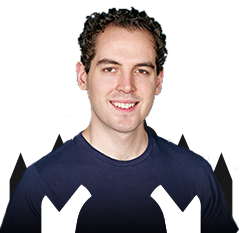 For example, let's say you're drafting Dimir (blue-black). Both blue and black will have the Dimir keyword. Blue will also have the Izzet keyword and black will also have the Golgari keyword. Three-color combinations will have access to four guild keywords. For example, let's say you're drafting Jeskai (blue-red-white, gotten from playing Boros with Izzet). White will have access to the Boros and Selesnya mechanics, blue access to the Dimir and Izzet mechanics, and red access to Boros and Izzet mechanics. What all this means is mechanics that share a color have to be synergistic with one another. In other words, Boros's mechanic have to play well with both Selesnya's mechanic and Izzet's mechanic. Meanwhile Selesnya has to play nice with Boros and Golgari, and so on and so on. This means that guild mechanics are not created in a vacuum. You have to make this house of cards where all the mechanics are leaning on one another for support. This takes what is already a tricky design process and makes it even trickier. I bring all this up because it had a big impact on how the mechanics played out. Vision design spent a lot of time trying to understand what was wanted for each guild. We looked at the past guild mechanics and gauged what had worked and what hadn't. We also explored where the guild identities felt right and where, for various reasons, they had been a bit off. We then set out to find the appropriate answer for each guild while also making sure the many mechanics were synergistic with one another. Once the set got to set design, the problem with any one mechanic would have a ripple effect on those around it. This is a long-winded way of me saying that of the five guild mechanics handed off from vision design, only two made it through to print. For each guild, I'm going to walk you through what vison design did and then explain how set design ended up with the mechanic they did. As my preview card today is an Izzet card, we're going to start with Izzet. Izzet has always had a bit of an identity problem. Flavorfully, when you mix blue and red, you get creativity—passionate thinking. Izzet is full of mad inventors that are constantly creating a spectrum of inspired devices. Mechanically though, the guild is about instants and sorceries. Blue and red have the most spells (in contrast to creatures) and thus, in game, have been spell-focused. Both its previous guild mechanics, replicate and overload, played into the mechanical theme but never the flavorful one. The goal of the Vision Design team was to create a mechanic that both cared about instants and sorceries and had some element of invention/creativity to it. We started by trying splice onto instants and sorceries. In Champions of Kamigawa block, the splice mechanic was restricted to arcane spells, a subtype of instants and sorceries. It ended up being a bit too parasitic (only allowing you to play with other cards from the same set) and never quite captured the feel we were hoping for. For years, we'd talked about bringing back splice but on instants and/or sorceries. We'd even talked about it for Return to Ravnica, but we'd chosen to only have new guild keywords, so it was off the table. That restriction no longer applied, so we decided to give splice onto instants and sorceries a try. In the end, it didn't live up to the hype we'd been building up over the years, so we moved on to other options. We tried a bunch of different things, but the mechanic we had the most success with was one we called "spellback." I don't want to completely give away what it is in case we can crack the problems it had, but I can say it was a mechanic that allowed you to mix and match various instants and sorceries. The idea behind it was that you could create explosive turns where you got multiple effects all going off at once combining in combo-friendly ways. This is what we handed off to set design. The mechanic ended up having what I call "the Spike problem." When played in the spirit intended, it was fun and flavorful. But when the mechanic was min-maxed (aka played the way that guarantees the most wins with it) it ended up being something that was not fun and didn't capture the feel we were aiming for. This problem now gets caught in vision design when we have play design check-ins where the play designers search new mechanics for this issue, but play design was not yet a thing when Guilds was in vision design (it would exist for most of set design and all of play design). The Set Design team took our goals and worked to find a mechanic that would do what we wanted Izzet to do but in a way that didn't break down when min-maxed. They came up with the jump-start mechanic. (You may cast this card from your graveyard by discarding a card in addition to paying its other costs. Then exile this card.) The basic idea was that it let you turn cards in your hand into specific instants and sorceries that you'd already played. By doing so, you can mix and match them to have fun combo-y effects. It also allowed you a lot of flexibility in how you used your instants and sorceries that matched Izzet's tempo play style. The finished product ended up looking a bit like flashback, but using cards as a resource rather than extra mana makes the mechanic play quite differently. I'm happy that it's the most Izzet-y (with regard to philosophy) guild mechanic to date. It's about time for me to wrap up, but before I do, I have a preview card to show you, an Izzet one that I know you're all going to want to see. 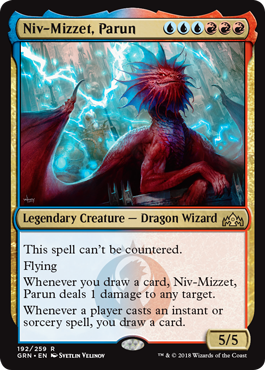 So, without further ado, it's time to meet the latest incarnation of Niv-Mizzet. That's all the time I have for today. One guild down, four to go! As always, I'm eager to hear your thoughts on this column or Guilds of Ravnica or any of the guilds in the set. You can email me or contact me through any of my social media accounts (Twitter, Tumblr, Google+, and Instagram). Until then, may you have fun playing whichever guild speaks most to you.